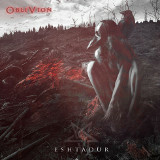 Eshtadur's latest offering comes in the form of an EP, Oblivion, with most of the elements, for better or for worse, that Stay Away From Evil and Get Close To Me had, but with fewer of the explicitly antireligious lyrics of the previous album, and done in an even slicker style than before. It's got plenty of black metal elements, but what predominates is a Gothenburg-style melodeath sound which succeeds in being varied enough that all but real purists will enjoy this one at least a little. The muddiness that is sometimes a hallmark of South American bands doesn't exist on Oblivion, which has a tight distortion on the guitars and Diego Torres' snares getting equal time with the two guitarists. A casual listener to their tracks might miss the clever synth they bring in, very minimalistically, and though the downtuned riffing, growling vocals, and guitar solos of Last Day of the Condor might lead one to believe there's more melodic death than melodic black metal in their sound, there's a very Sigh-esque vibe to the braying horn-march in the background of that track too. Vocalist Jorge López alternates between a raspy screech and a more traditionally death metal growl, and the latter style serves the band especially well on the crunchy riffs of The Currency of My Empire, probably the most melodeath track on the EP, which put me in mind of one of the lesser-known In Flames songs where they didn't use as many melodic hooks. The final track, The Rebellion, shows the keyboard's treatment to be even more delicate and minimalistic than the rest, and that's an especially hard thing to do given their uniting of black metal and melodeath into an accessible package (one look at their finely produced music videos reveals this dilemma). As a modern band that could easily turn their sound into mall-worthy junk by laying too hard on the blastbeats and catchy riffs, Eshtadur treads a fine line here, but succeeds in walking this tightrope on Oblivion without a misstep.